West Palm Beach, Florida is a great place to vacation with or without pets. West Palm Beach is on Florida's East coast, about 73 miles North of Miami and 170 miles South of Orlando. It's a quick drive to upscale Palm Beach, just on the other side of intercoastal across the Flagler Memorial Bridge. 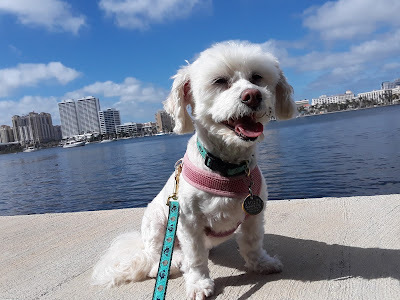 Phoebe overlooking the beauty of dog friendly West Palm Beach from the Palm Beach Lake Trail, across the Flagler Bridge & intercoastal waterway. Last month we took a road trip with our dogs from Long Island, New York down to West Palm Beach. After weeks of continuous frigid temperatures and more snow than I care to shovel, I had to get away from Old Man Winter! I'm so glad I had that break because upon our return to New York, we got hit with 4 Nor'easter storms in a row. Mother Nature has clearly lost her mind. I was delighted to see how dog friendly West Palm Beach is! I was so happy with our choice of hotel, the Hyatt Place hotel in downtown West Palm Beach. The location was perfect, especially for walking and socializing with the dogs. There were three areas, all walking distance to our hotel, that made this the ideal location for a pet friendly vacation. Just one block East of the hotel is the beautiful paved walkway that runs along the intercoastal waterway. This long walkway is perfect any time of day or evening. The path is wide and the views of the water are beautiful. There are some grassy patches too if your dog needs a potty break. Take a stroll down the long pier that stretches out onto the water for an even better view of the surrounding area. You can also walk your dog across the Flagler Memorial Bridge. 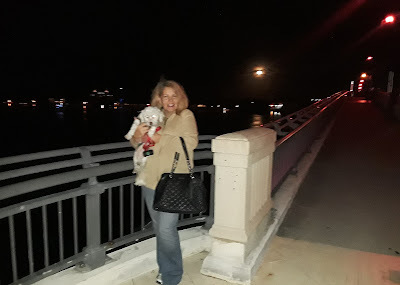 The bridge itself is so lovely and views of the water and downtown West Palm Beach are beautiful, especially at night. The Flagler Bridge beautifully lit up at night. Once you cross over the Flagler Bridge you'll be in glamorous Palm Beach. Just over the bridge on the left you will come across a parking lot and the start of the Palm Beach Trail. The trail runs for several miles along the intercoastal from the bridge, along most of Palm Beach island. Along the way you'll pass the famous Flagler Museum. 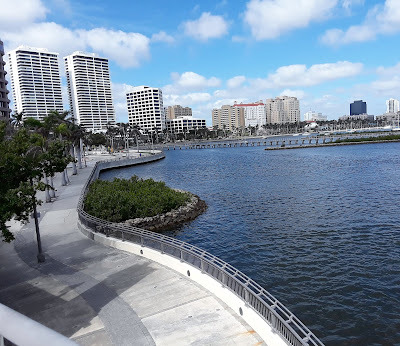 There are some gorgeous homes along one side of the trail and on the other side you get a great view of downtown West Palm Beach across the water. 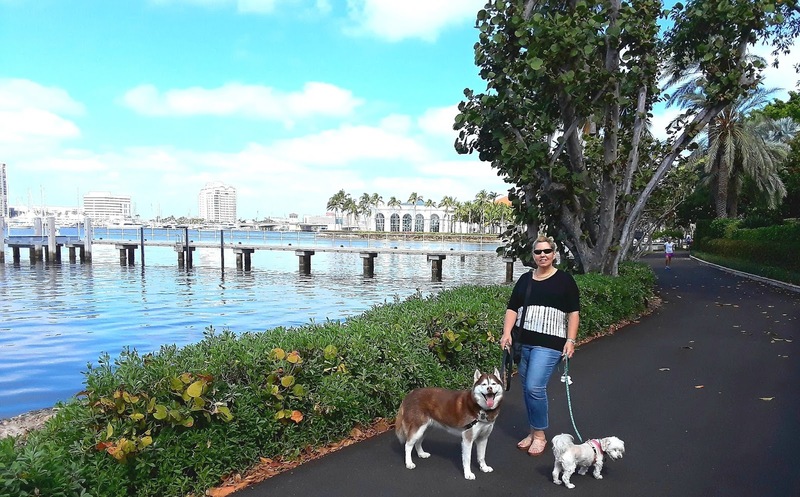 We loved walking the dogs along the Palm Beach Trail, enjoying the water views and peaking into the yards of the upscale homes along the trail. We really enjoyed the sites along this pet friendly walking trail! Thankfully, there were a few areas with shade where we could stop for a water break with the dogs. As we passed some of the private piers we saw a few big lizards sunning themselves. Icy was completely enthralled with the lizards and wanted to get up close & personal with them. Of course, we didn't let her get too close! Check out this wild looking tree we spotted at the edge of someone's yard along the Palm Beach Trail! 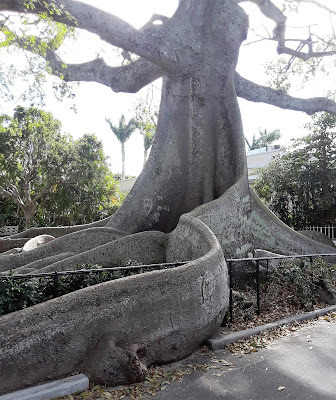 How'd you like to have this tree growing in your yard?? East of our hotel, along the water, is all natural beauty but West of the hotel is where the action is! About a 7 minute walk West of the hotel is City Place, an upscale shopping and dining area. It's not just an outdoor mall, it's an entertainment area, where they have music and other events taking place. The center of beautiful City Place, where there's daytime shopping and nighttime action! 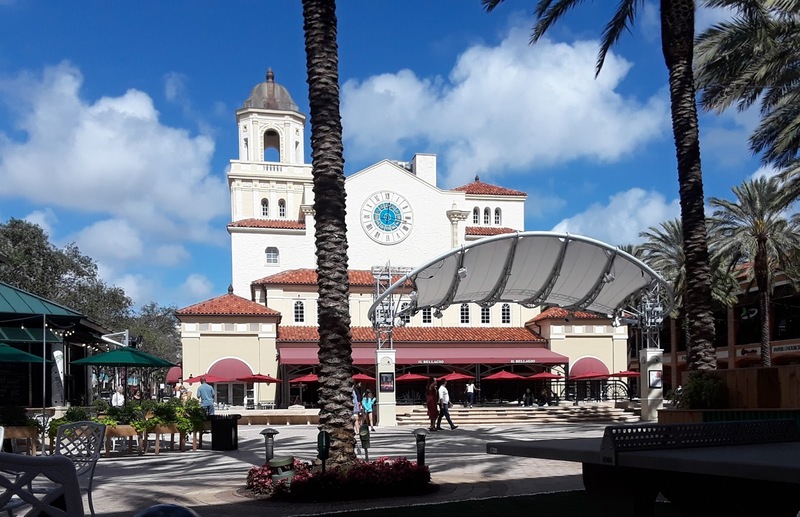 There are plenty of shops and restaurants in City Place. City Place is a large area, encompassing several blocks. We spent most of our time in the main "square" you see pictured above. 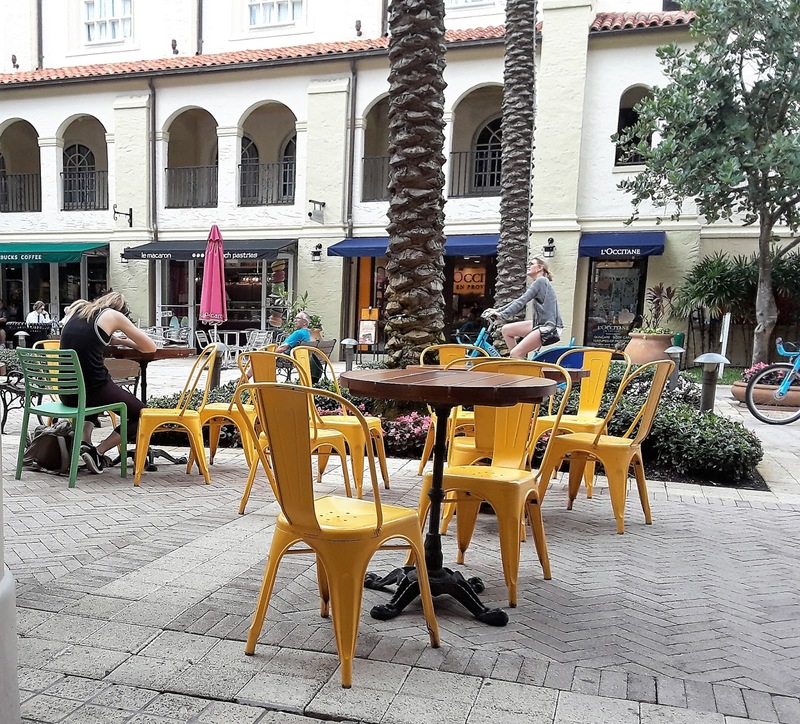 There are some great restaurants and shops in City Place, or you can just grab a coffee and people watch! 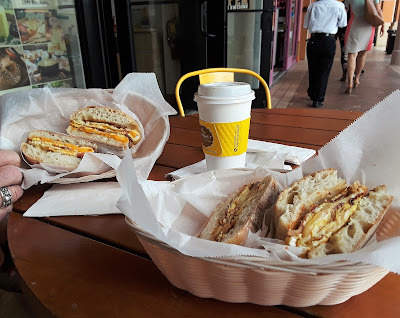 One of our favorite breakfast places was the Village Gourmet Cheese Shop in the center of City Place. We loved City Place and spent many days and most of our evenings there. 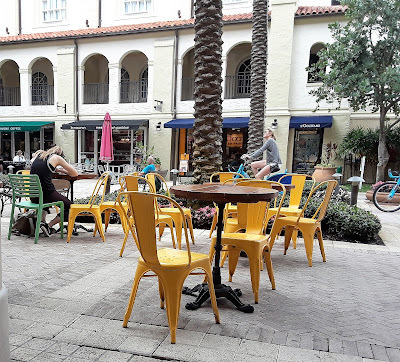 A word of caution: Clematis Street, near City Place, is kind of the "restaurant row" of downtown West Palm Beach. However, there are a lot of homeless people who hang out there, especially during the daytime. They have been known to come right up to outdoor diners asking for money and even grabbing food off their plates. I was accosted by a homeless man as we walked down Clematis one morning looking for a coffee shop. He kept insisting that I take a small plastic bag of food from him and feed the contents to my dogs. I don't know why he felt compelled to do that but he followed me for a few minutes trying to get me to take the bag. Of course, wasn't my husband 50 feet ahead of me, oblivious to it. LOL!! 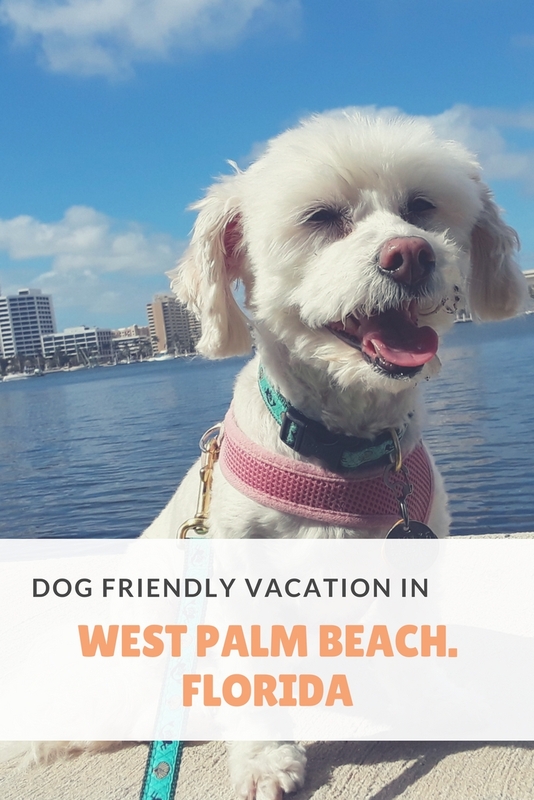 Another great thing about West Palm Beach is that it's only a 15 to 20 minute drive to the BEST dog friendly beaches, Juno Beach and Jupiter Beaches! Check out my blog post on The Best Dog Friendly Beaches In Florida to find out more about the two best Florida beaches that allow dogs. Would you consider West Palm Beach for your next dog friendly vacation? Tell us in the comments! Oh my doG, that TREE! Would love having that in my yard, it looks like something prehistoric erupting from the ground. Itsn't it the Wildest looking tree?! Those roots! Cookie looked at the photos and says, "too much pavement and too hot." BOL She never saw the ocean, I wonder what she should thing of that. It wasn't too bad because it was a bit cooler and lots of cloudy days. It must be hell in the Summer for sure! I bet Cookie would love the ocean. It sounds like a great vacation spot to enjoy the fun and sun with your pups! We are always careful of our surroundings. Sadly, it is hard to tell who people will do these days. It was one of the best vacay's ever with the dogs, we loved it so much! Monte would have walked that root of that tree! I have great memories of Florida. We never made it to West Palm Beach staying near Miami or Naples along the everglades. Next time!! LOL!! Isn't that the craziest root system? I've never seen anything like it. Monte would have had such fun. You know I've heard of West Palm beach but never traveled there. How beautiful! And that tree is a sight to see! What a great dog friendly vacation for the whole family! I'll have to add this destination to my bucket list. It really is beautiful, and so dog friendly! I was really so pleasantly surprised. Great doggie vacay. You guys don't live too far away from us! The weather we've had here has been so crazy. Looks like such a fun trip! We're trying to plan what will be our first vacation with our two dogs which I'm excited about! We haven't taken a vacation in over 10 years. Florida looks lovely but I'm not sure I'd enjoy the heat there. It isn't too bad in the Winter, many cool & cloudy days and the beach is heaven. Just don't go in Summer! West Palm Beach looks like a really beautiful place. If I ever went to the USA, Florida or California would be my first choice. I love the sun! If you love sun both CA and FL are the best places. Phoenix Arizona is awesome too. But don't go to Phoenix or Florida in the Summer, it's awful. California has much better year round weather. I've never been to West Palm Beach but it sounds lovely! What an amazing trip with your dogs. Sadly the homeless are a problem in many warm climates, and I do think it's sweet that a gentleman was concerned about feeding your dog. It was such an amazing trip, we loved every minute of it! It is very sad and it can be a bit scary sometimes. It was sweet but a bit strange, and he was so insistent for some reason. It looks beautiful! I would love to visit with my dogs one day. It's so beautiful! I think it's s a great place to visit with dogs, but not in Summer it's too hot. Such a variety of beautiful places to walk and enjoy your dog's company. I like the different views. The Intercoastal Walkway looks architecturally rich while the Palm Beach Trail looks full of nature sniffs. And that tree is w-i-l-d! Bernie wouldn't even know where to begin marking that thing up! LOL! Isn't that tree crazy!? It was so interesting, I loved seeing that. It was such a great trip, we loved it. That tree is pretty amazing! I've been to Florida several times as an adult to visit family, but we've never been to that area. It looks lovely! It's so amazing, and weird but beautiful! I loved West Palm Beach, Juno, and Jupiter - all 3 areas are stunning. You should go Beth! NA with their yellow water. I didn't realize that there were dog-friendly walking trails there. So glad you didn't take that bag of food to feed it to your dog...some people are sinister. I had that happen to me at a rest stop. No way would I ever let my dog eat food from a stranger. LOL!! I know, it's the weirdest tree! I loved seeing it though, I can't imagine how those roots grew like that. I'm sure many dogs had a bit of a thrill on that tree. I'd never let a stranger feed my dogs either, you just never know. Thank you Larry! Thanks for stopping by the blog. Love the pictures, it makes me feel warm in the middle of this cold snap we're having. I don't blame you for making a run for it. I lived in Florida for awhile and never made it to Palm Beach. I had to laugh when you talked about the homeless man and your husband being 50 feet ahead, oblivious to what was happening. That's my husband exactly!! Glad you and the pups had fun. That tree is amazing as are all the water walkways. Too bad about the incident with the homeless man. Maybe he was trying to be nice, but I'm sure it was still a bit unnerving. I'm so jealous!! I wish I were on a beach with my dogs right now. Your photos are gorgeous. Oh my gosh - we absolutely love this area! My in-laws have a place very close by and it just thrills me every time we go to visit. Looks like you had such an awesome time - and now I want to go! Your blog made me so envious! We just had an awful week in Chicago with extremely cold temperatures. 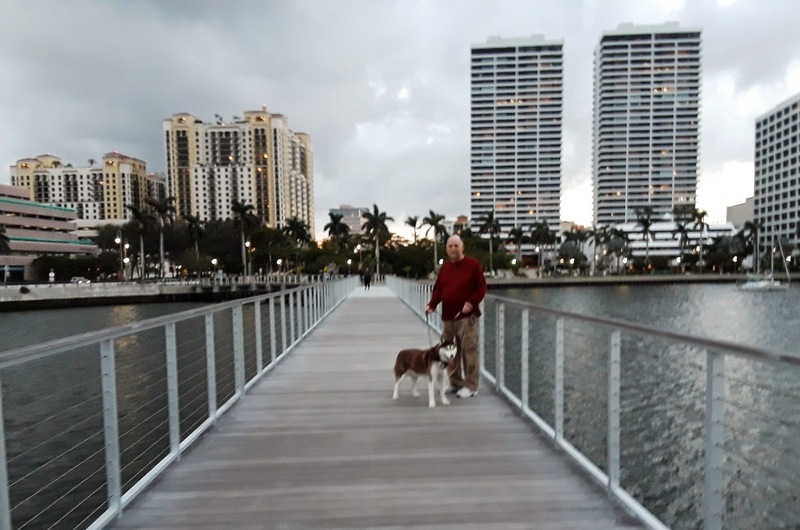 West Palm Beach looks like a great place to walk, with or without a dog. Your blog gave me an idea. I'll ask my husband to consider visiting our grandkids in Miami for one of their birthdays. We could really use a break from the cold and gloom! I am SO jealous! I love this place! The walkway at the start is very much like the walkway beside the river in Brisbane, Australia! Video! Wow that is so cute. I wonder if next time you could add a couple of closeups of the girls. Easy to do in an app like Videoshop (free) or Adobe RUSH! I think that Jasmine would not like seeing all the water and not being able to dive in it. Cookie would inquire about frogs. Looks very lovely, though. I love going to Florida, but I don't think I've ever been to West Palm Beach. Sounds like a wonderful place to visit. I've never been to West Palm Beach but I've heard great things! I love all of the beautiful walkways along the water! Especially that they're dog friendly. I love all your pics! So wonderful to travel with your pets, and this looks like a fabulous place to be (especially right now with all our snow and ice)! Happy surf and sand! Can Omega 3 Supplements Improve Pet Health?